Wirral Council’s Cabinet has agreed to spend £600,000 on additional work relating to the proposed Hoylake Golf Resort (background info). 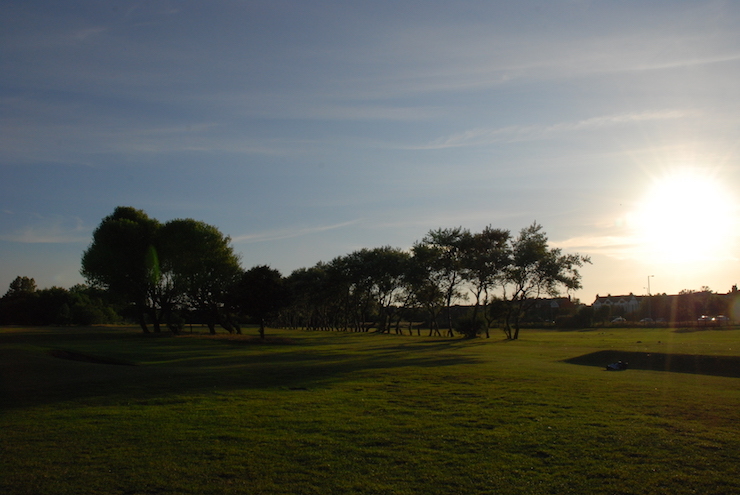 The proposed development site includes the existing Hoylake Municipal course (pictured above). A decision on the expenditure was deferred from last month while more information was provided to cabinet members, including a presentation from potential operators Celtic Manor. Cabinet gave the ‘thumbs up’ for £600,000 to be invested in a series of surveys, geo-technical reports and further commercial and legal recommendations so the proposal can move ahead. Cllr Phil Davies, Leader of Wirral Council said: ‘The Hoylake Golf Resort will be a major destination for visitors to Wirral from around the world. ‘We wanted to be satisfied our investment, only 0.3% of the overall development, represented good value for money so we took the extra time available. We are now looking forward to moving ahead to the next stage of this exciting scheme. In July 2015, Cabinet agreed to appoint the Joint Venture Group of legendary golfer Jack Nicklaus as its preferred development partner, and will now be asked to enter into a Framework Development Agreement, to enable the Jack Nicklaus Joint Venture Group to begin drawing up a comprehensive Funding Strategy, to be presented to Council at a later date. The plans also include a luxury hotel, conference centre and Links Academy to support Wirral’s ambition to be the Capital of UK Links Golf. Who’s getting a nice little back-hander then? This is an absolute white wash, council only looking more corrupt than ever. totally agree with you Peter. £600,000 from the public purse ? please make this transparent to the people of wirral. what benefits will the people of wirral expect to gain from this ? Like the baths, the bandstand, the tennis courts and the bowling greens all abandoned by the council. Nothing has ever happened in Hoylake that is council led and I’ll be surprised if it ever will. Open golf has been brilliant, but there is no retail along the prom, no cafe or ice cream in the summer, no toilets, no shelter and the beach is clogging up. Sad to say but I’m glad I left, it will always be the town I grew up in and its always nice to come back to for a visit. PS if this development is worth £190 million, why do the council spend their own money? its a rounding error to Celtic Manor. The council have already forced the landowner of the field to the west of Gilroy nature reserve to drain his field. this is a SSSI, important for the feeding ground and roost site of Black tailed Godwits, a RED conservation status bird. To me this feels like they are acting to degrade the environment of the area, to smooth the passage of the golf course development. There will be no consultation – why would there be when there is so much money invested and self-interest displayed – in the construction of this site. No transparency and no truth. Look at this! Shiny things! It makes you not look at the appalling Ofsted report into children” services. Or the council newspaper. Or Lyndale. Or the bins. Or Landican….. And that’s just a start. This will never, ever, happen, but they’ll spend £££ of our money just to divert you from the crap reality they fail to manage. wirral east is seething over this! I love this idea! Shiny new things are good – too many dull old things in Hoylake. It might just be a pipedream, a distraction from the dross, but it might, just might come true. And it’s nice to dream. But then Hoylake’s finest NIMBYs and their councillor buddies are sure to kill it dead, they always do in Hoylake. That’s when the money spent so far will be a true waste. This is an appalling misuse of public funds. The council cuts services for people, but subsidizes private profiteers. Shame! One of the essential roles of the public sector is to facilitate investment by business in support of the local economy. As such it is entirely legitimate. Moreover, WBC owns most of the development site. People should be careful what they say.